I pretty found the Apple Watch a misunderstanding on my own part through this piece of technology whilst, everyone was making a fuss from the live launch towards the pre-ordering date. Yet within a flip of a coin yesterday I became to understand ‘The Apple Watch’ with its sleek design featuring, the traditional parts of the watch from the straps to a lovely not too squared face. Speaking of the square the detail featured on the face of the watch, the technology which is incorporated into watch itself opens an optional way for adding a personalised touch whilst Mickey Mouse can be opted for a more fun approach which, questions from a normal watch’s characteristics of being serious, standard and being a luxury item. Which questions ‘Is the Apple Watch a step further of how the Fashion world will embrace it through design of the straps and technology it contains within a touch?’ Or is it just a smarter way to collaborate with the IPhone? The Apple watch has a ‘Taptic’ function from a gentle tap that alerts you from everything to whether you've been sitting too long to when you've received a message. It features imessages, notifications, the time, to even that ever help map when you go the wrong way across a town you’re not sure off whilst having the IPhone in collaboration which enables you to do more when you have both of them together. 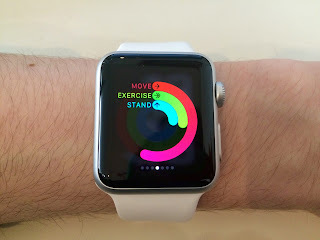 This will be the perfect option of a purchase for fitness which monitors all the tools and whistles the health app on the IPhone already does but every more convenient for you whether your running, dancing, Barre Core, walking to skipping. The Apple Watch is your personal trainer at a tap of the wrist. Afterwards of the appointment at the store I couldn't help but ask and discuss the watch. Since fashion is the heart of my blogging and lifestyle amongst business. I couldn't ask a more appropriate question over coffee with my good man of how the potential the Apple Watch has regards, of how it will embrace within Fashion e.g. look how many different ways you can buy a designer and brand’s take on the IPhone cover). I’m particularly guessing that street style would accommodate the watch’s sleek and at the moment the seven design straps around their outfits. Where the British Fashion Council is would question how they allow the watch to be added to their digital innovation platforms they already use throughout London Collections: Men to London Fashion Week amongst over BFC events. The question of how the Apple Watch can throughout the Fashion world can already be seen. Since the price range starts within the famous three hundred club at £349 for the Sport watch and goes up to the rise of the rose gold watch. (You can see that Selfridges) It’s a marked for the marked for the market where everyone can get involved and own the watch. What are your thoughts on Apple’s new product?